I really like those little Kinder Surprise eggs you can find alongside the grocery check-outs. I think the chocolate is okay, but I buy them for the toys inside. The first time I really remember buying them was at a school track meet held at Strathcona High School when I was in grade 7 (12). There was a 7-11 nearby, and I walked over and bought a few of them, opened them up, and went back for more. I was fascinated by the various toys you could get inside, things that would come in small pieces and had to be put together. I’ve often wondered who designs these wonderful things, and how smart they must be to create a little model that has to be interesting, yet also fit into a tiny egg. Have you ever taken a single piece out of a Kinder egg and been unable to get it back inside? How on Earth do they get all those pieces to fit so perfectly? It’s either brilliance, or dark magic. When I was 14 I went to Israel with my school, and I found Kinder Surprise eggs there as well. The toys were different from the ones we had in Canada, and at the time they had a special series featuring Asterix, a character that’s very popular in Europe, but a bit less popular in North America. It was on this trip that I realized the eggs held different surprises around the world, and I became interested in what other toys could be found in other countries. I’ve bought eggs, or had them given to me, from Canada, Israel, Mexico, France, Bulgaria, Belgium, UK, Germany, Italy, Ukraine… and probably one or two other countries. I usually get the small toys, but around Christmas and Easter they bring out a line of over-sized eggs, which I usually buy a day or two after the holiday at heavily discounted prices. I’ve often taken cases of them down to friends in the US because you can’t buy them there (unless they were illegally imported) because of FDA rules (I believe they don’t allow toys to be inside food items). Out of all the eggs I’ve ever opened, there’s one that I’ll never forget, and it was given to me by my wonderful wife, Kat. We went out to Von’s, one of our favorite restaurants, for dinner, and she pulled the egg out of her purse. I opened it up, but I didn’t find a toy inside, I found a little note that said “Will you marry me?” The answer, of course, was yes. Though I enjoy the Kinder Surprise Eggs, and I probably have all the toys I’ve received, I don’t have an obsession with collecting them. I’ve never completed a series, and I’ve never tried to either. I enjoy the toys that do something interesting, or ones you have to build. I don’t like the puzzles, or the little figures that don’t do anything. When Kat was in Germany a few years ago she brought me back a German catalog that contains photos and information on all the Kinder Surprise toys ever made. It’s a massive book, with nearly 1,600 pages, and has tons of toys per page. It’s broken up by category, and by year, and provides a neat visual history of the various toys you could find in the eggs. If only I read German! I have a ton of Kinder eggs that I haven’t opened yet, and I thought it may be fun to start opening them and posting photos on my blog. I have a couple of cases from Canada, two cases from Ukraine, and various eggs from all over Europe. Look for photos coming soon. I Like My Popcorn Spicy! Hey Gordo, When my kids were younger I used to buy them all the time. The kids got the chocolate and the toy, but I was the one who got to put the toys together. I think I enjoyed them more than the kids did. Definitely sounds like you got the better deal there! Some of the toys are absolutely awesome. I was looking at some of the new toys they have in the current collection, and there’s some neat ones. I think I may have to get a case of them (or two). Oh yes, Kinderschokolade 🙂 and I agree, the chocolate is so la la, okay, but the toys the deal! I can;t believe you still haven’t opened ones from Ukraine! I’ve got them for you at least 4 years ago! What a patience! I would open all of them in 1 day (probably in less them 30 min) and eat all the chocolates! I have fond memories of my dad buying my brother and I Kinder Surprises when we were younger. My brother and I would fight over who had the best toy. I agree with you… the ones you build are the best. I LOVE the chocolate though! 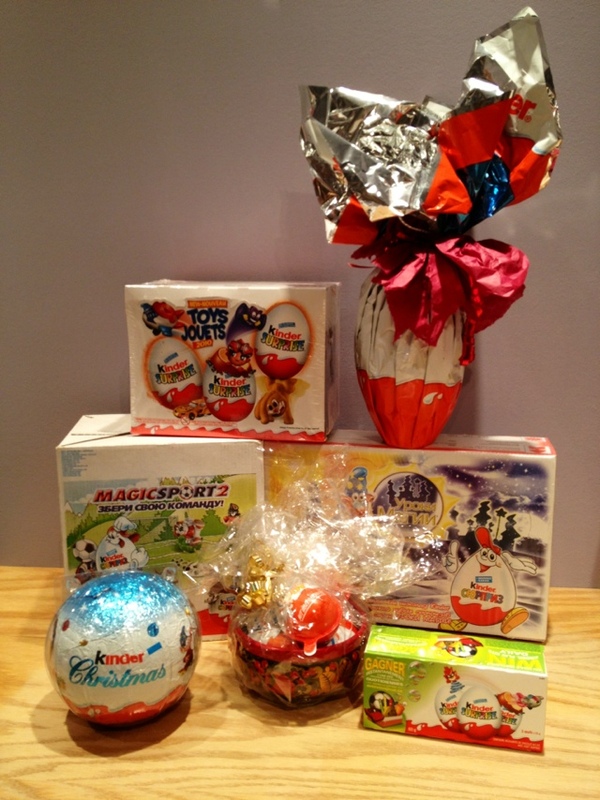 unopened chocolate and toys!?? Such discipline! I didn’t know that Kat proposed to you? I love that!